Perhaps more than any other rock star in history, Bono has taken the worlds of rock music and humanitarian activism by storm. Depending on who you talk to, he is an epic inspiration or an annoyance. Regardless, it's impossible to have an objective portrait of the man without first looking at the forces that have shaped him. 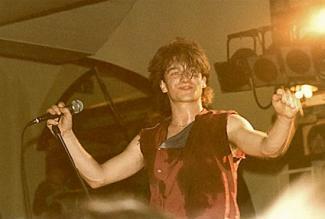 Bono was born Paul David Hewson on May 10, 1960, in Dublin, Ireland. Although the Irish Troubles surged in earnest during his early years, the Hewson household did not reflect the religious feud. His parents had agreed that their first born child, Bono's older brother Norman, would be raised in the Irish Anglican church with their mother, and that their second child would be raised a Catholic like their father. In the end, however, Bono drifted towards attending church with his mother and brother. However, when Bono was 14, tragedy struck. His mother died suddenly of a brain aneurysm while attending her own father's funeral. This loss became a formative force that would shape his creative work. Many of U2's songs would reflect this. In their album Pop, for example, Bono sings mournfully: "Mother, you left and made me someone / Now I'm still a child, but no one tells me no." Another pivotal event in Bono's life was his conversion to charismatic Christianity during his high school years, an event that also included Larry Mullen, Jr. and The Edge. They each nurtured a fiery commitment to a stripped-down, passionate, almost "punk rock" belief in the teachings of Christ. Adam Clayton did not share in this experience, and this became a source of tension in the early years, but the band mates were able to reconcile those differences and maintain strong friendships. He met his wife, Ali Hewson, at Mount Temple Comprehensive School as a child. They married in 1982 and are still together. He also met his U2 band mates, The Edge, Adam Clayton and Larry Mullen, Jr., at Mount Temple. Paul McGuiness became U2's manager at the very beginning of their career, and he remains in that position today -- an almost unheard of circumstance in music. The early eighties showed promise for U2 as their first four full-length studio albums and tours were successful. However, it was their fifth full-length studio album that struck gold. Bono's talent as a charismatic front man became world-famous with their breakthrough album The Joshua Tree in 1987, which peaked at number one in the US and landed U2 on Time Magazine's cover as "Rock's Hottest Ticket." This would just be the beginning of U2's rise to legendary fame. In 2010, Spin ranked it as the number one album of the last 25 years of any genre and described how it "genetically engineer[ed] rock music into the hybridized mutant we know today." The song One was track three on Achtung Baby. Rolling Stone ranked it as number 36 on its list of the Top 500 Greatest Songs of All Time. The album peaked at number two on the US charts, and it won a Grammy for Best Rock Album by a Duo or Group. It has sold over eight million copies since its release. This was also the album where Bono began his performance art and created a fictional persona for both the album and the tour: an exaggerated rock star character known as The Fly. 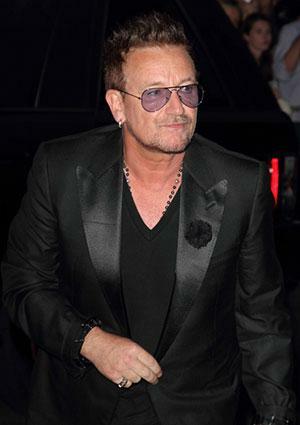 This satirizing alter-ego began Bono's famous habit of wearing sunglasses at all public appearances, although it also became a matter of necessity because his eyes are very sensitive to light. 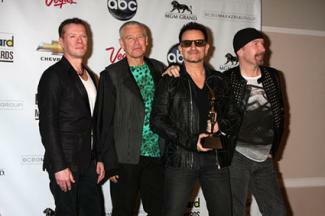 Bono's enduring persona and showmanship fill U2's years of success with a distinct personality. Whatever critics or fans say about him, it is difficult to deny his durability, both figuratively and literally. He has been a proponent of developing economies, especially in Africa, and he has worked with several different organizations dedicated to anti-poverty initiatives and HIV/AIDS treatment and education in Africa. He assists his wife Ali with running the EDUN clothing line, which employs workers in Africa with the goal of developing self-sustaining economy and industry. In the mid-2000s, he lobbied the Republican-held congress and met with George W. Bush in attempts to increase aid to Africa, especially in the form of life-saving antiretroviral drugs. Bono's efforts paid off: Both Bush and Congress acted in response. In 2011, Bono credited Bush's African aid policies for saving five million lives. He founded Product Red which works with various multi-national corporations to develop products with the Red logo to raise money for charity. A percentage of Red sales is donated to the Global Fund. He advocated the Drop the Debt initiative that urged developed countries and international loan organizations to forgive developing country loan obligations. In addition to these efforts, he has championed the causes of political prisoners and activists in countries like Myanmar and Iran. Bono's advocacy for foreign aid in Africa came to a screeching halt after meeting Professor George Ayittey, a prominent Ghanaian economist. In a speech in Ghana, Dr. Ayittey derided foreign aid and offered a different solution: entrepreneurial capitalism. He knew Bono was in attendance, and he took the opportunity to "rip into the foreign aid establishment" that Bono had championed. Although at first disagreeing with Dr. Ayittey, Bono would read his book Africa Unchained: the Blueprint for Africa's Future and later change his mind. 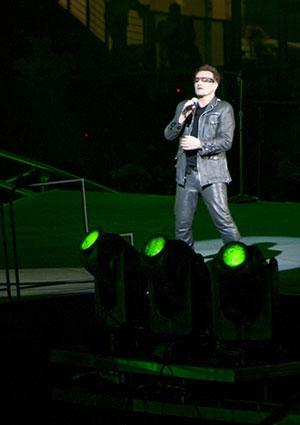 At a recent speech to Georgetown University, Bono said, "Aid is just a stopgap. Commerce [and] entrepreneurial capitalism take more people out of poverty than aid. We need Africa to become an economic powerhouse." An utterance of profanity on a live feed of the Golden Globes show caused an investigation courtesy of the FCC. U2 moved the bulk of their money out of Ireland and into bank accounts in The Netherlands right before Ireland increased taxation of musicians' royalties. In The Netherlands, these taxes are extremely low. Some aid workers take issue with Bono's ONE anti-poverty work for being big on ideas, low on actionable outcomes. Despite the criticism it is undeniable that Bono is one of the most powerful musicians and public figures alive today. 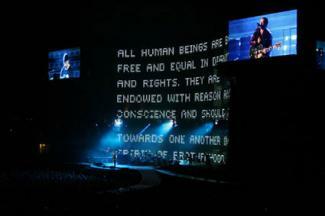 In the song Moment of Surrender from the 2009 album No Line On the Horizon, Bono sings the line "vision over visibility." This lyric summarizes Bono's life perfectly. He has pursued grand visions instead of settling for the easy visibility of the status quo.